From by the bay, wishing you delicious maple bourbon food memories! Combine into a soup pot chicken stock, cider, carrot , onion, celery, bay leaves, peppercorns, giblets and neck from turkey. Bring to a boil, lower heat and simmer for 1 hour. 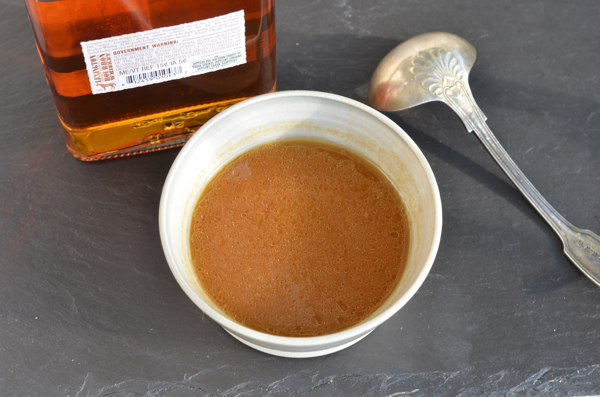 Cool and strain broth and keep refrigerated until ready to make gravy. This can be done one day in advance. Place seasoned broth into a saucepan. Bring to a simmer. Take melted butter in a bowl and then add the flour, whisk until a smooth paste. Take one cup of hot broth and whisk into flour mixture until smooth. Sieve back into the broth and whisk to blend. Add maple syrup, salt and pepper and whisk again. You can have this prepared as the turkey is roasting. Once the turkey is done and removed from the roasting pan and pour pan juices into a measuring cup. Spoon off fat and discard. Add remaining juices into broth in the saucepan. Place roasting pan back on heat and deglaze with the bourbon. Scrap pan to get all brown bits, let reduce to half , about 2 minutes. Add to the gravy. Whisk together and let simmer until reduced to a sauce consistency. Remove bay leaves, adjust seasoning with salt and pepper. Serve with turkey. This entry was posted in Sauces and tagged Bourbon recipes, fall recipes, maple bourbon gravy, maple bourbon roast turkey, maple recipes, Thanksgiving recipes, turkey gravy on November 15, 2016 by entertainingbythebay.